The cello is a very versatile musical instrument. Of all the stringed instruments, it is the most like the human voice and can produce a wide variety of tones, from warm low pitches to bright higher notes. The instrument is used in a wide range of musical genres and can be heard as a solo instrument, in chamber music groups, with baroque ensembles, in symphony orchestras and on many occasions in contemporary, folk and jazz music. 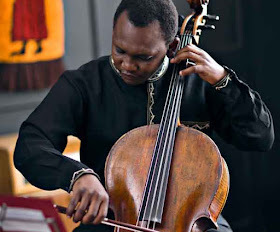 It was this versatility, along with the voices and moods that the instrument is capable of, that young cellist Abel Selaocoe wished to demonstrate with his eclectic programme for his recital which took place in the Beethoven Room at the National Arts Festival in Grahamstown. Selaocoe is the winner of the Standard Bank Young Artist for Music Award at this year’s festival. The 24-year-old cellist is a rising star in his field. He started playing music at the age of nine in Sebokeng in Southern Gauteng. He has been based in England for the past seven years where he studies at Royal Northern College of Music in Manchester. He has performed as a soloist with many orchestras, including the KwaZulu-Natal Philharmonic and the Johannesburg Philharmonic. He started his recital by playing French Impressionist composer, Claud Debussy’s Cello Sonata in D Minor. This short work is structured in three movements, with the second movement being rather unique as most of the solo part is played pizzicato. Overall, it is an ornamental, lyrical and energetic piece of music. The next work was also by a French composer. Maurice Ravel’s In the Style of Habanera. Ravel used the slow sultry Spanish dance, the habanera, for this piece and the rhythms of this dance can be heard throughout. Frank Bridge was next. He was a British composer and the first movement of his Cello Sonata was heard. Bridge was a pacifist and this work written at the start of the First World War, displays his great despair over the futility of war and the general state of the world. In the Style of Albéniz, a Spanish flavoured piece by modern Russian composer Rodion Schedrin was next. This was followed by a composition by James a Scottish classical composer and conductor. His work is entitled Kiss on Wood and is a spiritual reflection of Christ on the cross. The final piece on the programme was Lamentatio by the Italian composer Giovanni Sollima. Both Selaocoe and his accompanist Tyler Hayes, put in accomplished and polished performances and handled the virtuoso sections with skill and panache. Before each item, Selaocoe described the music to be heard. He showed an easy and friendly charm.